A revised version of the Longmeadow's General Bylaws including amendments approved at the 2010 Annual Town Meeting and approved by the Massachusetts Attorney General is now available for review on the town website (click here to view). All current and future negotiated labor contracts shall be announced in our local newspaper(s) no later than two weeks of said settlement. A hard copy of all negotiated labor contracts shall be deposited in their entirety at Storrs Library. 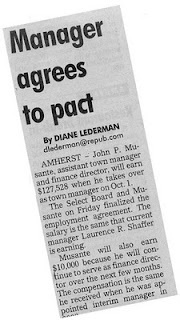 In this morning's Springfield Republican there was a business article about the contract for Amherst's new Town Manager including compensation details. Click here to read the full newspaper article. This new town bylaw would require the Town of Longmeadow to publish details of all negotiated labor contracts as they are approved. Hopefully, this would include contracts for the new School Superintendent, Town Manager, etc as well as Longmeadow Teachers contract, etc. The new bylaw states that all current contracts should be deposited for public view at Storrs Library as well. One employee contract of interest is that for the new School Superintendent. On May 11 town voters at the Annual Town Meeting approved the FY11 School Department budget (dated 2/22/10) which included a Superintendent salary of $135,000- a 9% increase from the FY10 Superintendent salary of $123,600. On June 14 the School Committee (see meeting minutes) approved a revised FY11 budget with the Superintendent's salary set at $155,000- a 25.4% increase over FY10. With the current Longmeadow teacher's contract set at a 0% COLA for the next two years, a 25.4% increase seems a bit too much- particularly given the "as advertised" credentials and experience of the new superintendent. According to School Committee meeting minutes (February 22, 2010) Marie Doyle had accepted the town's offer of employment as Longmeadow School Superintendent pending successful contract negotiations. In a March 22 SC executive session, a contract proposal was discussed and approved in open session for presentation to Ms. Doyle (see meeting minutes) and execution by Chairperson Mary Vogel. However, I could not find any SC minutes for subsequent meetings documenting whether or not the contract was accepted by Ms. Doyle and there was no mention of additional negotiations. Question: When was the new School Superintendent's salary finalized? For most people who followed the FY11 budget process, the Superintendent's salary for FY11 was $135,000 since this was in the budget information provided to town voters at the ATM and it appeared (though not reported on the School Department website or by local newspapers) that the School Superintendent had been hired prior to the ATM. This is a mute question since Massachusetts state law requires the town voters and ATM to approve a total school budget only- not line by line. The SC is certainly within their authority to line shift the dollars to increase the Superintendent's salary (which they apparently did at their June 14 meeting). I may be all wrong in my thinking.... so adding a copy of the current Superintendent's Contract to Storrs Library will restore my confidence that the development of our budgets (town government + schools) are done in an open and transparent manner. Based upon implementation of the new town bylaw I expect that all negotiated labor contracts (which I assume means Town Manager, Longmeadow Teachers, etc., Police, Fire....) will be made public "in their entirety" at Storrs Library in the very near future. but there is still a long way to go! 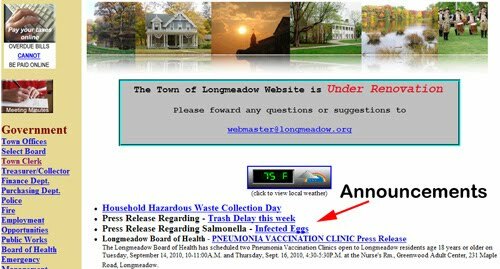 There are now announcements from Town Hall being posted on the town website- www.Longmeadow.org. A new notice was also posted today that the Town Manager’s Website TaskForce will asking town residents how to improve the website and what other electronic services should be offered. Now that I know that there are some people at Town Hall reading the Buzz blog and reacting to at least some of my comments, I would like to offer the following suggestions…. Keep the town announcements and event calendar timely and up-to-date. Town residents want to know about street repaving work and other project work “before” it begins. There is currently some street reconstruction work going on this week on Longfellow Street. I know that Center School sent out letters to parents but not all of us have kids attending Center School so a town wide announcement would have been useful. The new agenda “tab” on the Calendar solves the "readability" problem that I mentioned in my last post.... thanks! Meeting minutes…. I attended last week’s School Building Committee meeting and posted some notes here on the Buzz. At this meeting on Sept 15 (8 days ago) there were 4 sets of minutes approved dating back to May. Why are they not posted on the School Building Department website? How about Select Board meeting minutes? There is only one new set of minutes posted for the combined School Committee/ SB meeting on September 20, but where are all of the other ones for meetings this past summer? How about meeting minutes for all of the other boards/ committees/ commissions? The new Massachusetts Open Meeting Law (Section 22 (c), effective July 1) states: “Minutes of all open sessions shall be created and approved in a timely manner. The minutes of an open session, if they exist and whether approved or in draft form, shall be made available upon request by any person within 10 days. 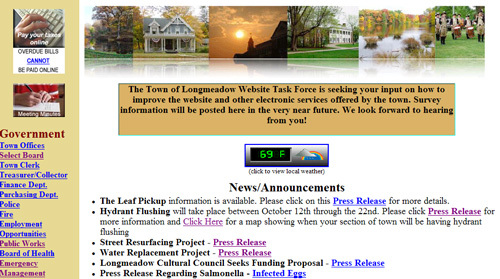 The new www.Longmeadow.org website should provide town residents with easy access to all meeting minutes. The Town Manager and “webmaster” should actively solicit this information. Posting of meeting minutes 2-6 months after the meeting has occurred usually provides information with very little worthwhile value. Perhaps “draft” meeting minutes could be posted (and labeled as DRAFT) as soon as they are available possibly within days of a meeting. (A former Longmeadow School Superintendent (Tom McGarry) posted his meeting "notes" on the town website within a week of the meeting.) This would permit town residents to better understand what is happening and attend the next meeting or write email if necessary to provide their comments. This would be a large step forward in communicating with town residents. There is an organization called Common Cause of Massachusetts which actively promotes better e-Government. Each year they evaluate (and re-evaluate) official city and town government websites in Massachusetts using an established set of criteria and recognize cities and towns in Massachusetts accordingly for their efforts. Through my work as town webmaster Longmeadow has received this e-Government award for the past three years. There is a “with distinction” award designation which Longmeadow has not received because some documents have been missing from the website. Receiving the e-Government “with distinction” award should be a goal of the new website team. There was a strong interest by three members of the Select Board (Aseltine-Barkett-Swanson) to take control of the website and convert it to an “official town government” website. That makes a lot of sense since significant taxpayer money will now be used to support the website. Providing technical support for community organizations including website development and other needs should be considered outside the scope of the website. LongmeadowBiz, LLC has already made an offer to provide Storrs Library with free website support but it has been refused. It will be interesting to see how long it takes the Website Taskforce to make their final recommendations to the Select Board. Hopefully, in the meantime there will be continued effort to keep the website up to date. Town residents have been accustomed to better service. What’s happened to communication in Longmeadow? 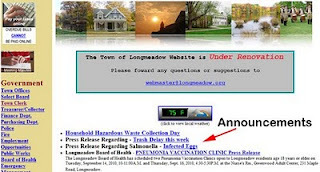 The Longmeadow town website- http://www.longmeadow.org/ once acclaimed for its outstanding delivery of information to town residents has seen a significant deterioration during the past two months. Anyone who has followed the “insubordinate volunteer” incident here on the Buzz blog or in the local newspapers is aware of the town website situation. The town website has now been under renovation for almost two months and Select Board has not as yet developed a plan to provide town residents with an effective website and access to up-to-date information. At last week’s Select Board meeting it was reported that the Town Manager’s Website Task Force had met for the first time but no update was presented. There have been efforts to post announcements for town residents on the town website as shown below in a snapshot from earlier today. However, three of the four notices currently posted are out of date. The new "town calendar” on the website homepage provides a somewhat better attempt with posting of town govt meeting dates but the accompanying agendas are sometimes difficult to view completely or print. I rate this effort at a C- and is not what town residents have come to expect from our town website. I have attempted to continue posting town government announcements on the Longmeadow Community Bulletin Board and Town Calendar as I had been doing for the past five years. Both of these free web based resources can be found on LongmeadowBiz.com. Some time ago, I made a simple request to the Town Manager and the various department heads that LongmeadowBiz be added as a media outlet on the distribution lists for town press releases. That never happened and last week I found out why. Rob Aseltine, Longmeadow Select Board chairman, had unilaterally directed Town Manager Robin Crosbie to block any press releases or event information from being sent to LongmeadowBiz. This was done without formal discussion with the other members of the Select Board. In addition, all visible links to these free town resources (Bulletin Board and Town Calendar) have been removed from the town website which has caused further frustration for town residents in their search for the latest news. There are upcoming flu shot clinics planned by the Board of Health, Maple Road is being repaved soon, high school building project construction will begin, etc…. How are town residents going to be informed? This continued retribution by Mr. Aseltine against me for my blog posts in early June regarding the School Building project has clearly resulted in poorer communication between the town and its residents. His effort is obviously directed toward my LongmeadowBiz, LLC enterprise and he is doing whatever he can through his position as an elected town official to disable its effectiveness and popularity. rbarkett@longmeadow.org , cswanson@longmeadow.org , psantaniello@longmeadow.org and mgold@longmeadow.org . Be sure to visit the Longmeadow Community Bulletin Board and the Town Calendar on LongmeadowBiz.com to stay connected with what is going on in Longmeadow. I will try my best to make available to Longmeadow residents all town government and other related information.